Welcomed back into the City of Roses yesterday by a low ceiling of gray clouds, a steady drizzle, and a breeze that packed a bit of a bellow, I was intent on recreating a pasta primavera I had shared over the weekend with our youngest daughter at a fairly nondescript italian eatery nestled on a sleepy main road in Half Moon Bay, just outside of San Francisco. It's not that that pasta was particularly special. We had had far more interesting fare during our visit together. It's that this pasta can truly live up to its name... offering such a grand promise of spring that you can't help but feel your mood instantly lift. With the local high falling pitifully shy of 50 degrees at touchdown, I figured a pasta primavera... awash with vibrant color and fresh, bright flavor ... was exactly what was needed to allay that little sting of melancholy that seems to linger longer than welcomed when I leave either of our daughters after a visit. It's basically Springtime in a bowl... and it only takes 15 minutes to get there. 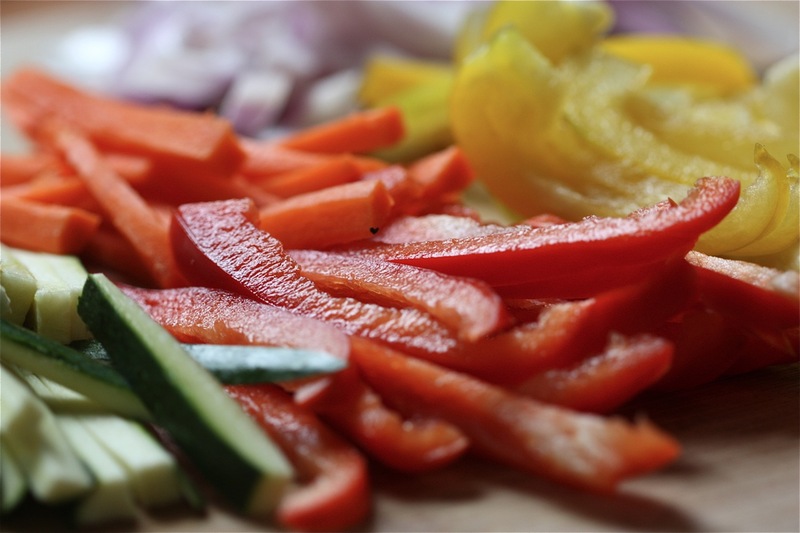 You set a large pot of lightly salted water on high heat to boil, while you get busy slicing up your veggies. When your water is ready, drop your pasta in for about 9 minutes, until al dente. Meanwhile, begin your sauté... onions and carrots in first, followed by the peppers (a little minced garlic, if you like), and then the zucchini. Season it all up with a little kosher salt and ground black pepper, to taste. And, just before plating, toss in your black olives and add a little drizzle of fresh lemon juice. Top each plating with a sprinkle of fresh parsley and parmesan... and another little touch of extra virgin olive oil, if you'd like. Then just settle in and enjoy the season... fleeting though it may be. 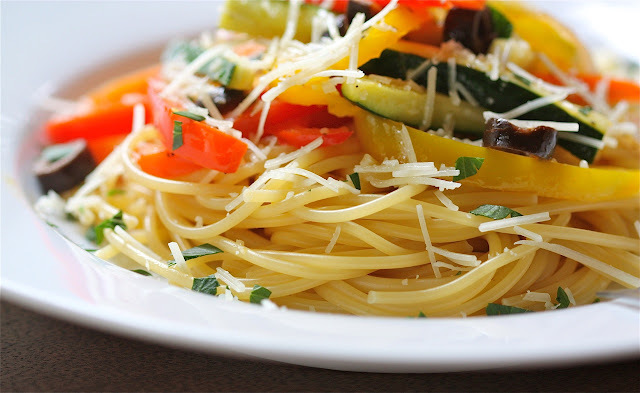 This is one of those dishes where you can add more (or less) of any of the veggies to meet your particular taste... go heavy or light on the spaghetti, add an extra drizzle of olive oil once plated, or not... it's entirely a dish that will easily adjust to your own palate. If you're not a lemon lover, just add a wedge to each plating to squeeze, if preferred. The same goes for the parsley. Not sure if it's to your liking? Then pop it into a dish and sprinkle on sparingly, or not at all. Set large pot of lightly salted water to boil over high heat. When ready, drop in pasta and cook for approximately 9 minutes, until al dente; drain and set aside. Meanwhile, heat two tablespoons olive oil in a large non-stick skillet over medium heat and add onion and carrot. Sauté until onion is just slightly translucent, about 3 minutes. Take care not to brown veggies, adjusting heat accordingly. Add in peppers (and garlic, if preferred), continue to cook for another minute. Toss in zucchini and sauté another 2 to 3 minutes, adding salt and pepper, to taste. Remove from heat, toss in olives and drizzle lightly with a touch of fresh lemon juice. 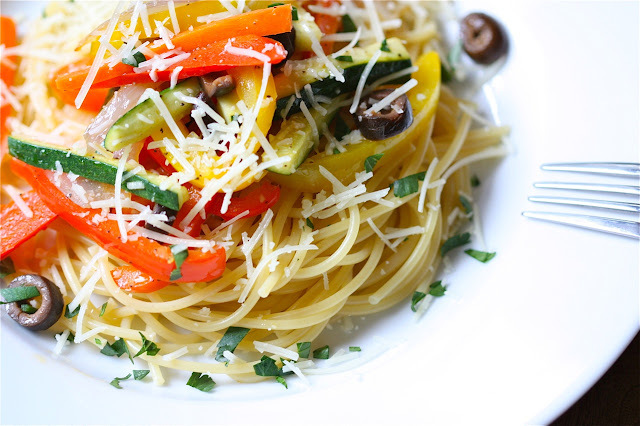 Plate spaghetti and top with veggie medley, a sprinkle of parmesan, and a bit of fresh parsley. Serve immediately.